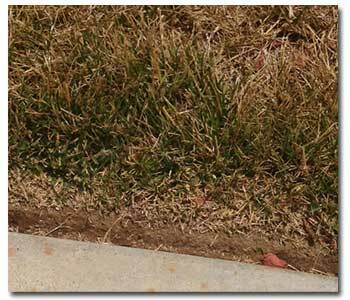 Grangetto's Farm and Garden Supply Services - » Why is My Lawn Brown? Why is My Lawn Brown? You water well, but your lawn still looks like it’s slowly dying.. There are numerous issues that plague our lawns. 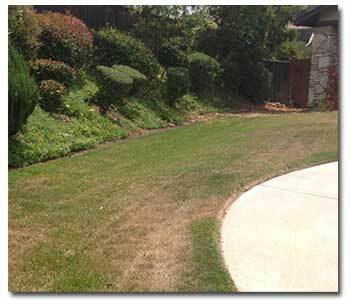 During times of high heat, as in summer, fescue lawns tend to brown very easily. If they are being watered sufficiently during these times and fertilized correctly, they shouldn’t look too bad, should they? You wouldn’t think so, but issues such as lawn fungus, lawn insects and simply a lawn that is too compact will cause browning. If you are watering adequately and your lawn is still browning, first check your sprinklers and make sure water is covering all areas of your lawn when turned on. Often times sprinklers can get out of alignment and need adjusting from time to time. If your sprinklers are providing full coverage than that’s probably not the issue. Make sure you don’t have a lawn fungus. When a lawn is too compact, the water won’t penetrate deeply enough before it either evaporates or runs-off. Check to see if your lawn is compact and might benefit from aerating. Often enough if you aerate your lawn once a year and provide a good top-soil such as Kellogg® Topper, your lawn will not be too compact. Some lawns may require aeration a couple times per year. You can aerate anytime of year. If you did not do so in fall or spring, and your lawn is suffering from being too compact during the summer, aerate and then apply a good lawn fertilizer (if you haven’t recently) to get nutrients back into the soil. Be sure to water in deeply after you fertilize. Consider aerating again in fall and apply the top-soil then. Visit your local Grangetto’s if your lawn is suffering so we can help you resolve your lawn issues!